. . . and babies make four. : The $35 castle that didn't follow us home. The $35 castle that didn't follow us home. Summer in Chicago is a never-ending attempt to squeeze a year's worth of outdoor living into a few month's time. I love that about living here. 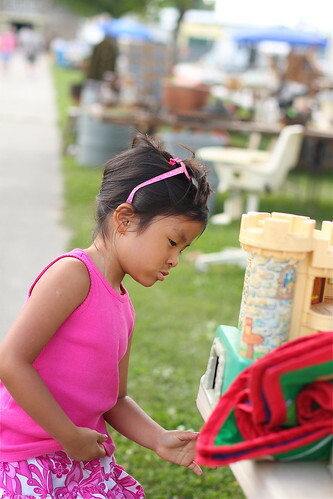 This weekend we took the girls to an outdoor flea market that's about 60 miles outside of Chicago. It's my favorite flea market and it was a beautiful day to wander around and look at antiques. 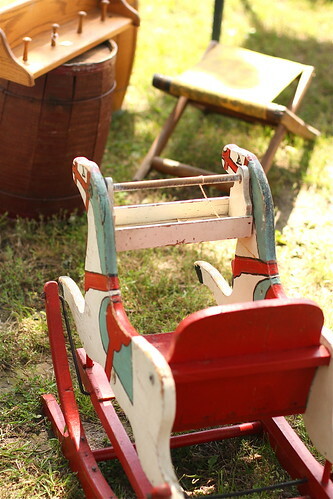 The girls found a table of vintage toys for sale at the flea market. (I have to admit that it makes me feel just a little old to know that the toys I played with as a child are now being sold as "vintage collectibles.") There was a plastic Fisher Price castle that they were particularly smitten with. The castle was faded, in terrible condition and $35. Needless to say, we didn't buy it. 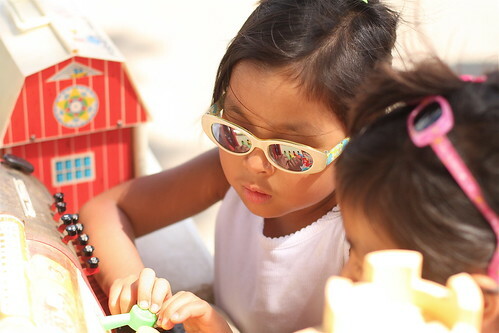 Even without a vintage plastic castle to take home, the girls loved the flea market. They loved looking at all the "fancy" dishes and "grand" chandeliers. They loved every riding and rocking toy they found and were invited to sit on. And they loved the vendor who just happened to have a bowl full of candy in his booth and gave them each a piece. They carried that candy around for more than an hour before giving the sweaty, gooey wrapped pieces to Eric. And I love that even more than summer. My sister grew up in Wilmette and her two oldest girls were born in Chicago. We went to a flea market that I thought was about an hour away to find things for their room, so we could then refurbish them. 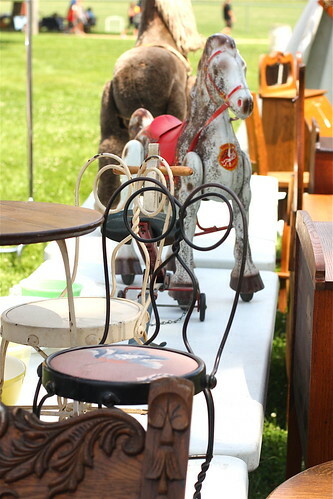 I loved that flea market and even found some stuff myself(that I then had to find a way to get it back to Western New York) - I wonder if it is the same flea market? What fun! I think your weather must be similar to ours in Canada, lol. where is this at?? is this the one in St Charles? It's not the one in St. Charles. It's in Sandwich, Illinois. The one in St. Charles has become more swap meet than antique flea market -- lots of "wonder towels" and chiropractors wanting to check your spine. I was surprised how much smaller the Sandwich flea market was this time. It made me kind of sad . . .